3 Effective Ways to Sabotage Your LinkedIn Profile for Job Search! THREE (3) Effective Ways to Sabotage Your LinkedIn Profile for Job Search! Not personalizing your LinkedIn URL is a big mistake. Your personal URL when it is edited to just your name is much more effective if you want to be found in search. SEO or search engine optimization by Google will help you show up in search when someone searches Google for your name. When someone requests a request to connect on LinkedIn there are several things I look at. The first is the URL. The other alternative would be to include your name and industry:"MikeJonesAccountant" or your business name :MidwestAccounting". Either way you need to set yourself apart from others with your name and for SEO. Job Seeker – Seeking next opportunity or "In Transition" in the headline is the area where your skills and search terms have the biggest bang for your buck. But seeking communicates nothing about your skills, experience or how you help solve problem. The words seeking opportunity and transition are not listed as search terms in LinkedIn skills section. So you are wasting valuable space for skills or search term placement. You only have 120 character so don't waste the space with empty words. Seeking also is not what recruiters or hiring managers are looking for. It simply describes a circumstance, yours, which has little relevance in the mind of an executive recruiter or employer looking to hire. It's your problem so put it in the summary so you can explain what you are looking for. At best it’s factual, at worst it borders on desperation. No Picture is probably the kiss of death in search on LinkedIn. Most people and recruiters what to see what you look like. In heat vision search on LinkedIn profiles found that almost 20% of the time is spent looking at your picture or the area where your picture should be. Without a picture on a profile people with ask three questions. Don’t you know how to upload a picture? Is this a FAKE profile? 5 Crippling Beliefs That Keep Your LinkedIn Profile OUT of Search Results! Belief Number one: you don’t have a picture, and if you do it is’t optimized! A picture on LinkedIn increases your chances of profile views 11 times. An optimized picture means you name your picture (YOUR NAME LINKEDIN PROFILE MARKETING MANAGER) and it will increase your search results not only on LinkedIn but will show up on Google search as an image result. Belief Number two: Your LinkedIn headline is your current job title and company name! Most people use the default setting on their LinkedIn headline which is their current job title and company name. Never use a default setting on LinkedIn it will brand you as a commodity. Your headline is your tagline or marketing piece. It should include 3 things. What you do, who you help, and how you help them. Number three: Your LinkedIn summary is about YOU! Your summary should be in the first person and yes the first paragraph should tell people about what you do. Just make sure every sentence doesn’t start with “I”, “I”, and “I”!! The second paragraph should tell you client or customer or recruiter how you have helped previous company or jobs increase sales cut costs, or streamlined a procedure. The third paragraph you tell how you will solve their problem! Make sure to add a “call to action” (Contact me to see how I can help your business with marketing solutions. Number four: You loaded your LinkedIn profile with keywords instead of searchable skills. Most people use keywords on their profile which is OK but to get better search results use LinkedIn skills. Skills are search terms that people using LinkedIn have already search for. EXAMPLE: Friend of mine wanted to be found for “Public SPEAKER” We searched the skills section and it wasn’t there, but “Public SPEAKING” was there. So we changed his headline for the searched skill of Public SPEAKING. If you want to be found on LinkedIn you have to be in their network. If you are not in a persons network you will not show up in search results. The fastest way to increase your network is to join groups and make sure they are large groups. LinkedIn changed it search about a year ago so when you search it used to be you searched all of LinkedIn, not anymore your search results are only the people in your network. The Zen of LinkedIn Skills and Social Selling! Sales people want to be found on LinkedIn. Sales managers want clients to find them on LinkedIn, and sales leaders want customers to find them on LinkedIn. I know sales people are always looking for customers, clients and sales but sometimes the customer comes to you because your profile resonates with them. Why are some profiles magnates for clients and others scare them away? If you engage someone in the C-suite, an influencer, or a future client on LinkedIn and your profile is average at best, will you get their attention? Does your profile reflect the skills or more importantly the skill set they need to solve their problem? Skills on LinkedIn are search terms that your customers and clients are looking for. Do you have the skill set to attract those customers? The average sale today involves 5 or more people. Is one of your skills cross functional problem solving or multi-level communications? Are you in sales or consultative selling, in other words are you solution selling? 89% of buyers turn away from the sales person if they don’t have the right insights or knowledge about their business, do your profile skills demonstrate that knowledge? How to find skills, the easiest way to find skills is to search your competition. That’s right, when you do a search for the term “sales” on LinkedIn search box the results are the best profiles for that (skill) search term. Who are the sales leaders in your company? Look at their profiles and the competition to see what skills people in your industry have on their profile. But do it anonymously, you know, change your privacy settings!!! If your results turn into a hot lead you can even follow them on LinkedIn! Which skills to add to your profile? When you are searching for skills for your profile don’t select the first skills you see. Be strategic, don’t just select MARKETING, ask yourself which skills are my customers are looking for? Is it “on line marketing, social media marketing, digital or email marketing that people need?” When you are searching in the skills box the dropdown will give you a list of skills and that list is in numerical order of number of searches. Aim for the skills that you have that are highest on the list since they are searched most often. Where to add the skills to have the best search results. On your LinkedIn profile the most optimized and highly searched areas start with your HEADLINE. Your headline should not be your job title and company name, you already have that in your experience section. Your headline should include at least 3 skills, tell people what you do (include a skill), who you help (include a skill), and how you help them (include a skill or two). Then strategically add skills at the beginning of your summary, and at the beginning of every paragraph. Then add at the bottom of the summary (after your call to action) type in the word SKILLS: add ten skills that you have the most endorsements for. Each job experience should include skills as well as the summary of each job. Make sure you select all 50 skills to add to your profile. Finally add skills to your interests section, these should be business interests (skills). How to use the skills section on LinkedIn. To view the secrets behind the skills section click on the blue “View Profile As” then you will see your profile as your client would view it. Then scroll down to the skills section and click on the name of the skill. Behind each skill are people, topics, education, groups, articles, and additional skills related to the subject skill. These are additional skills you should add to your profile because they are related skills which could make you a better skills fit than your competition. If you are sharing content with your leads the skills section is an ideal area to supply you with content for your customer, it has Lynda courses, Slideshare presentations, as well as Pulse articles related to your skills. You have to be the subject matter expert for your customer or your client’s resource for their problem. Slideshare and Pulse articles will give you an advantage over other sales people because they don’t have access to this information but you will. Make sure you share content about your customer’s interests not yours. There are thousands and thousands of articles to choose from. As with any sales process you have to be consistent and persistent. LinkedIn is the same way and they are consistently changing, so you have to be persistent with the skills on your profile. Bruce is a Retail professional with 30 years varied experiences. He has worked in every facet of retail, from being an entrepreneur, to having corporate positions with a “Fortune 500” company. After his corporate retail position was eliminated in 2009 he became involved with LinkedIn, Twitter, and social media in his job search. In 2011 I started my own social media business, Hobknobery to provide one-on-one profile consultations, presentations, and workshops for LinkedIn. He expanded into social media marketing for small businesses, training recruiters how to use LinkedIn, and social selling for salespeople and business development. Most recently he has presented workshops for recruiters, outplacement companies, small business groups and companies as well as webinars for national retail businesses. Your LinkedIn Profile: A Movable Fete. Your LinkedIn Profile: A Movable Fete! Your LinkedIn profile is a business networking platform and profile marketing tool!! If you don’t like where a section on your profile is, just MOVE it! 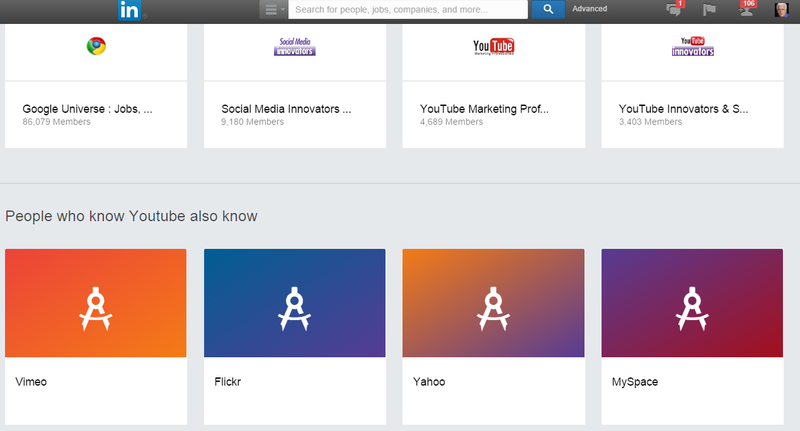 What, you didn’t know that you can move most sections of your LinkedIn profile? Eighty per cent of the people on LinkedIn have no idea that just about every section on LinkedIn can be rearranged. And even sections within some of the sections they can also be moved. Let’s start with the main sections of your LinkedIn profile. Yes you can move your summary, skills, experience, volunteer experience, education, organizations, certifications, courses, honors and awards, languages, publications, projects, and additional information. The question is which section do you want where? Move your cursor over the section you’d like to move, then click and hold the Reorder Section icon in the top right. Release the Reorder Section icon to drop the section into place. Most people start off with their summary section to give the profile viewer a snapshot of your profile where you tell them who you are, what you do and how you help them. Now the LinkedIn default is to place your experience next. But do not ever use any LinkedIn default setting. So this gives you an opportunity to move this section of your profile. So why would you want to move sections of your profile? If you are in business this would give you an opening statement to place your summary at the top of your LinkedIn profile. You could follow this up by the experience you have had regarding the experience and accomplishments you need to solve a client’s problems. After the experience you can place the skills section with its endorsements from others for social proof of your success. If you are in job search you also may start with the SUMMARY SECTION and use that in place of your elevator pitch. Make it an elongated version and tell recruiters what you do, what you have done in past work experience and how you will solve a new companies pain points. But the second section for job search should be your SKILLS SECTION because that is what recruiters and hiring managers are searching for. Make it easy for them to find your skills. 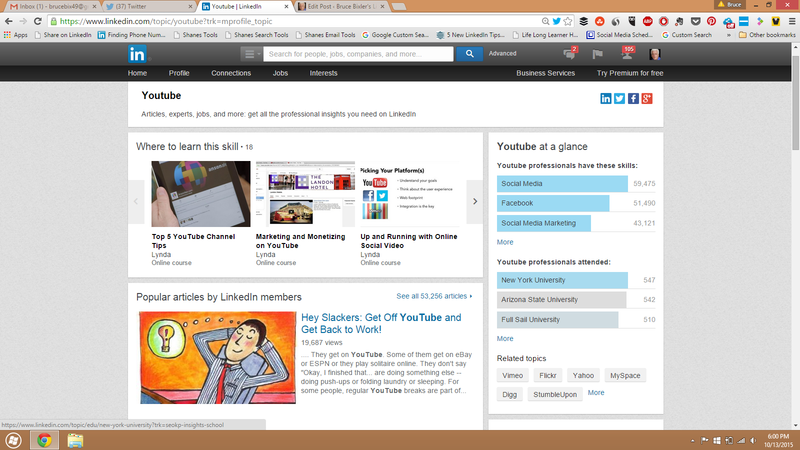 The EXPERIENCE SECTION if you have two or more current positions on LinkedIn can be rearranged. 1. Move your cursor over Profile at the top of your homepage and select Edit Profile. 2. Move your cursor over the position you’d like to rearrange. 3. Click and hold the Up/Down arrow to the right of your position name and drag it into the desired position. Note: You can’t rearrange the order of past positions. Those will always appear with the most recent position held showing first. Recommendations, following, groups, companies, and schools and Pulse articles are not movable. Another area that you can rearrange parts of is the EDUCATION SECTION. 2. Move your cursor over the education entry you’d like to rearrange. 3. Click and hold the Up/Down arrow to the right of your school name and drag it into the desired position. Note: The first entry listed in the Education section appears in the box at the top of your profile. You can’t display more than one entry in the top box of your profile. Next you can rearrange your publications. 2. Move your cursor over the publication you’d like to rearrange. 3. Click and hold the Up/Down arrow to the right of your publication title and drag it into the desired position. You also can rearrange your whole volunteer section but then you can also rearrange the different volunteer activities within the section. Finally the other movable section is the skills section. 2. Scroll down to the Skills & Endorsements section and click anywhere in the box. 3. Move your cursor over the skill you’d like to move, then left click and drag to re-order. You can do this for each skill you’d like to reorder. And finally you can move your endorsers, LinkedIn will allow users to change the order of which photos show up for a certain skill. If I have missed any moves let me know and I can edit the article. Bruce is sought out by leaders in sales, business development, training, and recruiting who recognize the need to attract client’s and customer’s through Corporate Strategic training of LinkedIn, one on one consulting, and private workshops. You are shown how to use all of LinkedIn’s resources. To discover how this process can benefit your organization, simply reply to this email bruce@hobknobery.com or call Bruce at 224-221-9700. 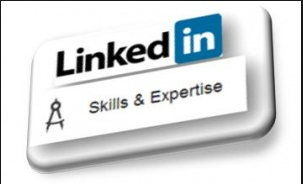 Skills on LinkedIn, How to find them in the Alumni Function! It used to be called Skills and Expertise section on your LinkedIn. Now it is called Skills and Endorsements. Whatever you call it you used to be able to sort through the different skills and select the ones that pertained to you and your industry. Now that LinkedIn has removed the skills and expertise section from the website, how do you add skills that pertain to you and the position you are looking for. 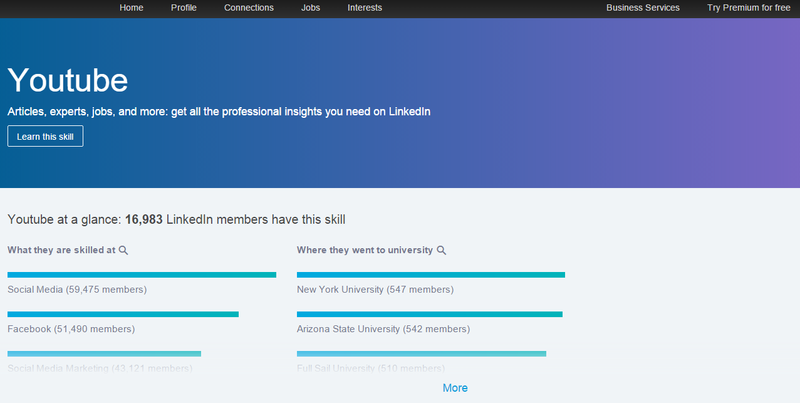 One way that is available on LinkedIn is the alumni section. Alumni section?! Here is what you do. Start at the toolbar at the top of your page. Scroll over the network section and there is a drop down. 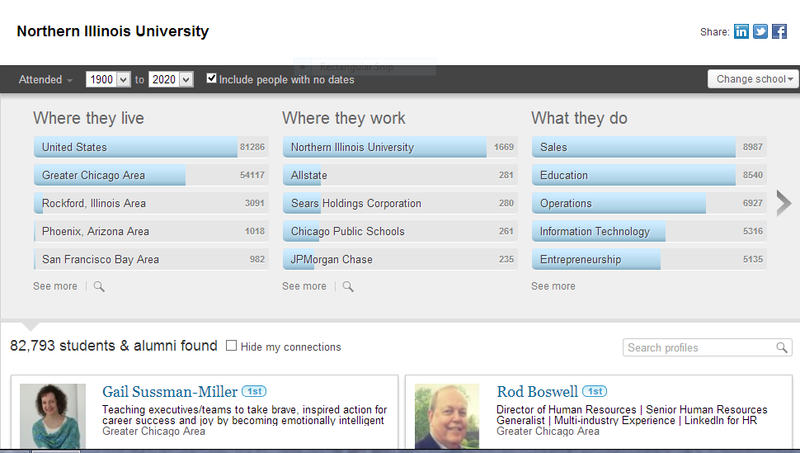 Select the “Find Alumni” choice. Click on it. 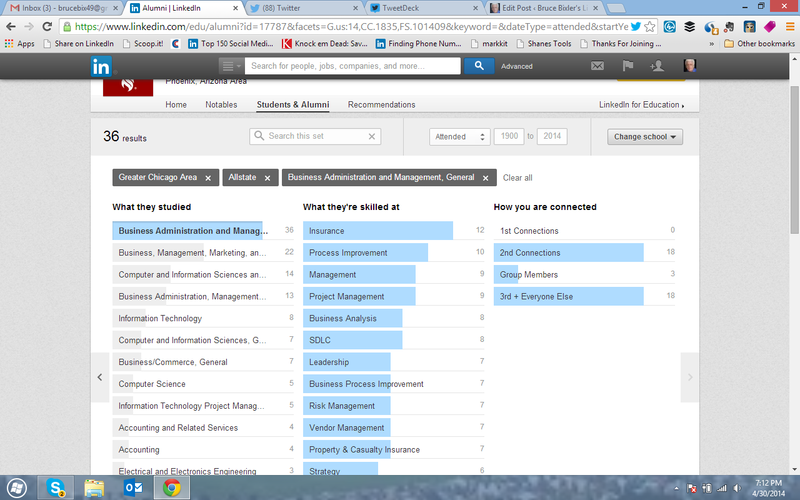 You will now have the choices of not only the college(s) you went to but all colleges listed on LinkedIn profiles. You can use the search box for all colleges. Select any college or university in the search box. The larger the university the better. Bigger demographics to filter. First select city for search, then select company, and finally profession. (IT, HR, or Marketing). You will then have to “arrow” to the right and there will be a list of skills in desending order of popularity for that position for that company. Try this with several colleges and universities to see what the skills for this company are prevalent for your position. Add these skills to your LinkedIn profile to help you stand out for these keywords. So if you live in Chicago, want to work at Allstate, and are in Business administration and management these are the skills you should have on your profile. How to find Keywords for LinkedIn Skills and Expertise. 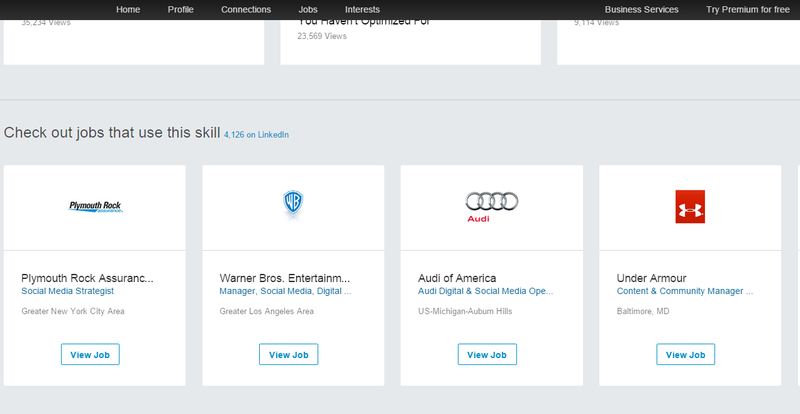 Now that LinkedIn has removed the definitions and related skills from the LinkedIn profile what are you supposed to do. One of my connections showed me how to find related keywords using Google. 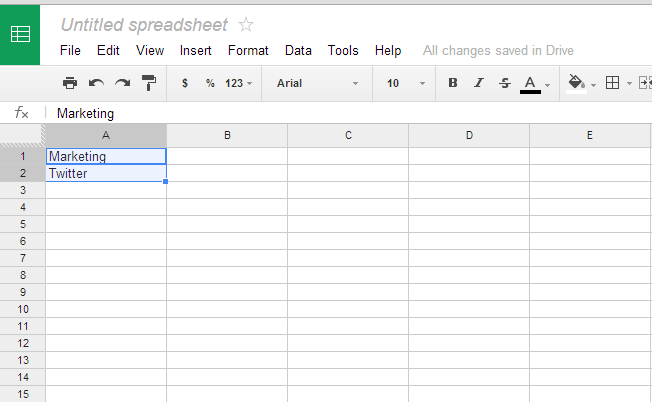 The first step is to use Google, Google Drive (Formerly Google Docs), and Google Chrome. 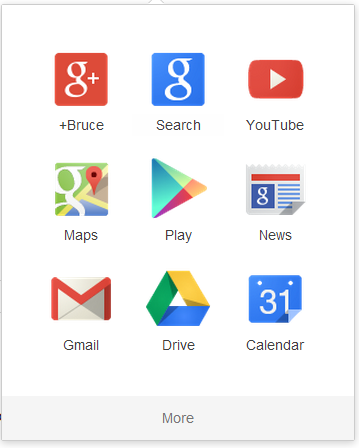 Step 1) Using Google go to the Google apps and select Google Drive. Step 6) Highlight both cells and a SQUARE box in the lower right cell will appear. 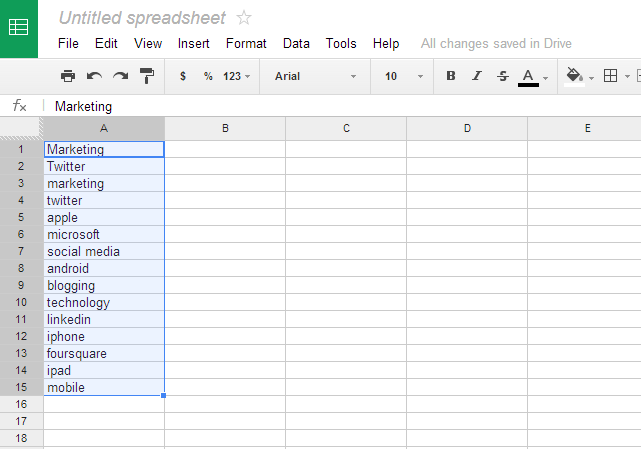 Voila, you now have a list of additional keywords courtesy of Google!! 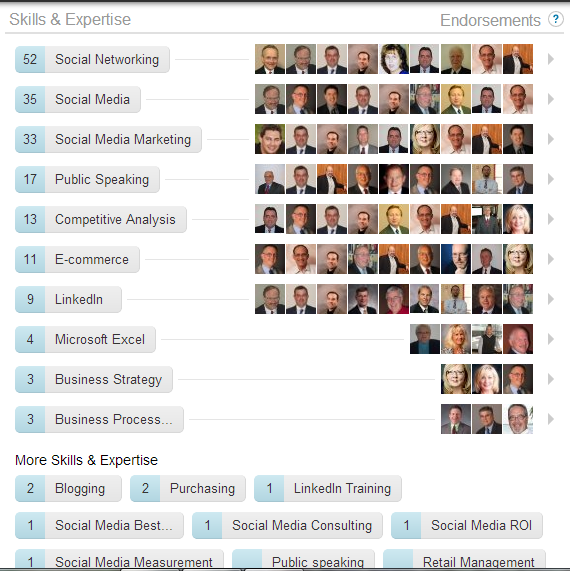 Now go ahead and select and add skills & expertise to your LinkedIn profile.